Measures 11.75"L x 6"W x 6"H.
Your little guy can chewed off all of the lava blocks, also uses it to sleep and jump on. 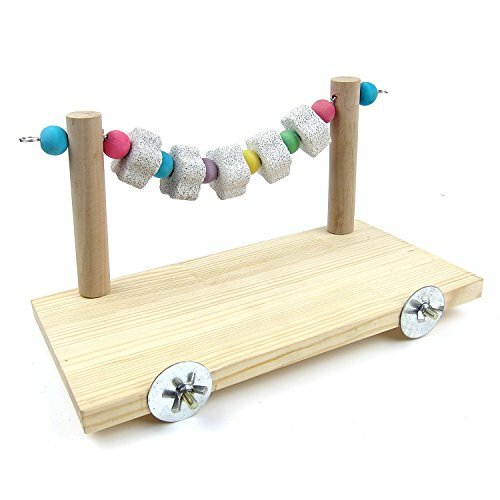 Chinchilla will love this ledge platform toy and when the pumice stone is all chewed you can remove the sticks on the side so its still a nice wooden shelf. Made of natural wood material. Add a natural look to your pet's home, while giving him a fun spot to play. The platform perch easy to mount on the bars, and it holds up very sturdy. For a small breed or young pet, ideal for hamster, mouse, rats, guinea pigs, chinchilla and other small furry animals. If you have any questions about this product by Hypeety, contact us by completing and submitting the form below. If you are looking for a specif part number, please include it with your message.